Chicagoland's Real Estate Sign Installer! Below you will find pricing for our standard installation, commercial installation and other services. If you have questions please visit our FAQ's page or contact us. Never pay a service fee! 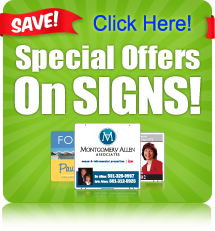 Finally, a simple way to get all you need from your Sign Installer – all at one easy price! Oakley Sign Installation is proud to introduce the nation's first No Hassle Sign Installation payment model. It's simple. One price for sign installation, removal, AND all service calls* needed for a given listing along the way. Imagine this... you request to have a sign installed at your newest listing, over the next 4 months you need 3 mores service calls and once the listing sells, you need to have the sign removed. You can now get all of this for only an additional $6.00. You will never have to pay anything extra... no matter how many service calls you need. That's right, for just $6.00 more than our already low installation rates; you get all the service calls you want. Need a new rider this week, another one a month after, and then the panel needs to be replaced in three months, no worries. There are no extra charges. *Missing post, rider rental and brochure box fees still apply as those are not associated with the installation of the post itself. Please note: If gas rises above $4.00 per gallon, a fuel surcharge of $1.00 per installation will be applied. If gas rises above $5.00 per gallon, the surcharge will be $2.00 per installation. Copyright © Oakley Sign Installation, LLC.